February may be our Love of Reading month, but face it, who doesn’t love books ALL the time? Everything from the cover art, to the feel of holding the book in your hands, to turning that page. Nothing truly compares to or has the smell of a book. This is the true story of a sometimes book collector. Recently, a book came into our store, unintentionally reminding me how much I actually do enjoy a good book. I don’t consider myself a “bookie” by any means. But I do love nostalgia. As an adult, I lean toward collecting those forgotten or hidden gems I had found as a youngster. Re-reading this treasures sent me right back to the time and place of my original reading. Then the excitement floods through me all over again. Recently, one of our long-time customers brought in a large number of books for trade. Some newer, some vintage. A great collection that had just a little bit of every genre in it. As we were going through the piles of books, from the middle of one stack, I pull out a light blue hardcover book and noticed the name Andre Norton. My heart jumped. There it was! My absolute favorite book as a child. I couldn’t believe it. A story I had read over and over again; a tale originally my third grade English/Science teacher made us read. Though set in the future, it seems very much in the present. It touched on a very real reality that was as scary and even worse now. The subject of pollution. Aimed at ages 8-12, Outside was the short story of cities having to build domes around themselves due to the world’s poisoning itself with pollution. 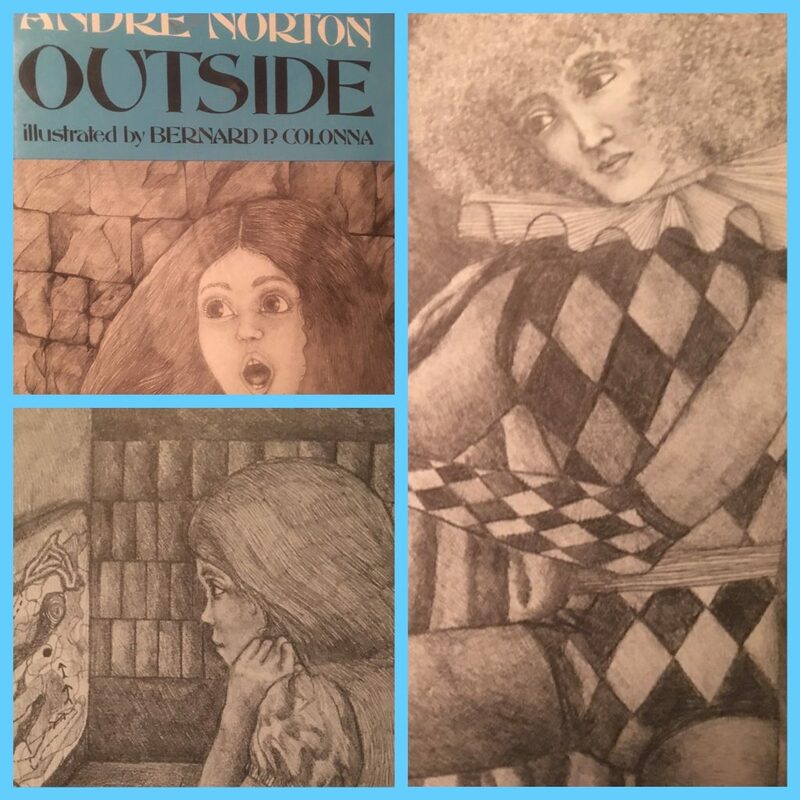 Outside was originally published by Walker And Co. in 1974. Bernard P. Colonna’s beautiful illustrations complement the author’s story. The author himself was a children’s librarian. Andre has been the recipient of many Science Fiction and achievement awards. She was the author or co-author of over 250 novels, including 52 books with collaborators. Before the books of sparkly vampires, wars in the stars, and even a Hogwarts, there was this one, that first book that pulled me in. This is serious nostalgia for me and it fills me with excitement to reunite with and rediscover this book again. This is my #LoveOfReading story. If there’s a particular book you’re looking for, stop into your favorite Bookmans location. We will do our best to try and help you locate it. If you’re a thrill seeker, be sure to check out our Blind Date With a Book displays at any one of our locations. You never know who you might fall in love with. What is your #LoveOfReading story? Tell us below!